This recipe comes to you courtesy of my sweet little girl, Katy. Chocolate Biscuits are one of her favorite treats, and I actually have three different ways that I make them. Today, I’m showing you my extra special way to make feather light chocolate biscuits, with a lovely little glaze on top. As far back as I can remember and as far back as our family “stories” go (the ones that are handed down from generation to generation) biscuits have been a staple on our tables. There are as many ways to make them as their are cotton plants in a field, and all of them are wonderful in my mind. The great thing is that these recipes have been handed down from one generation to the next, and at some point we’ve each taken our turn standing in the kitchen while the craft was explained and demonstrated before we stepped in and began making them on our own. This recipe just sprang up out of Katy’s love for chocolate and my desire to do something creative with it, so it isn’t a generation’s old recipe, but it will become one as soon as Katy Rose starts making them herself. Right now, she’s beside me, helping with each step along the way. Sometimes I just stand over her shoulder and talk her through it. Soon enough though, I’ll be off doing something else while Miss Katy works kitchen magic all on her own. And that is what it is all about. Cooking up memories together while equipping our kids to cook them up on their own. Next time you head into the kitchen, I encourage you to take the hand of someone dear to you and invite them along. Now y’all come with me while we make us some biscuits…. You’ll need: Self Rising Flour*, Whole Milk*, COLD Butter, Semi-Sweet Chocolate Chips, and a little sugar. *To make your own self rising flour, simply add 1 + 1/2 tsp baking powder and 1/2 tsp salt for EACH cup of all purpose flour. 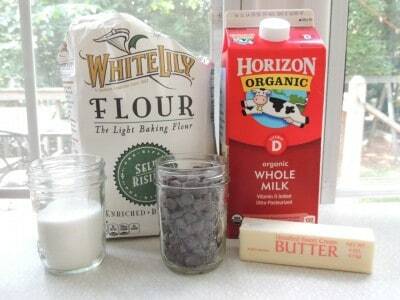 *You can use buttermilk in place of whole milk in this recipe if you like. You can also add one tablespoon of vinegar OR lemon juice to the amount of milk called for and stir, then let it sit for five minutes before using to make your own buttermilk. Or you can just add whole milk and leave it be. It will be good either way. 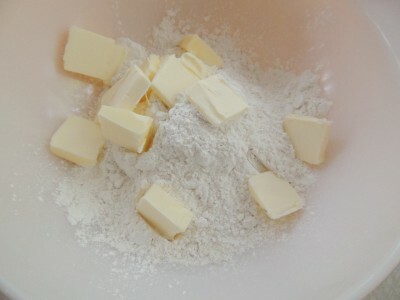 Cut your butter up into pats to make it easier to cut into the flour. Cut it in with a pastry cutter or long tined fork. I used to be adamant about only using a fork since that is what my grandmothers used but as my age has creeped up and Uncle Arthur have decided to visit more frequently up on me, I’ve given in to the ease of a pastry cutter on these old hands of mine. 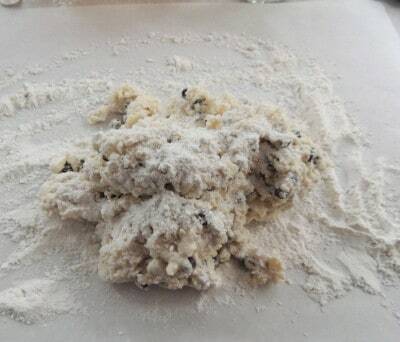 IMPORTANT: After you get the butter all cut into the flour it will look like a slightly lumpy flour mixture. Place this whole bowl in the fridge for ten minutes. After ten minutes has passed, stir in chocolate chips and sugar until well mixed. 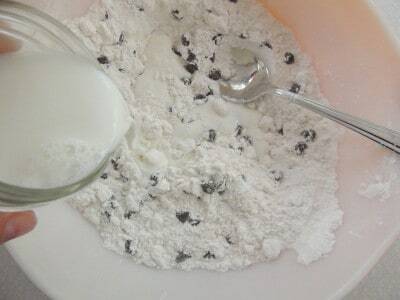 Pour in milk and stir until all of the flour has been moistened. This will be globby dough when you are done. 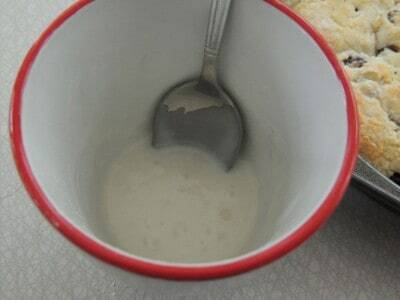 After you’ve stirred in the milk, if you still have dry spots, you can add a little more milk, maybe 1/4 of a cup. Don’t stir too much, just what you have to do, because while we want everything nice and moist, we don’t want to overwork our dough. Place some waxed paper or parchment paper on a counter and sprinkle liberally with more flour (self rising is fine). 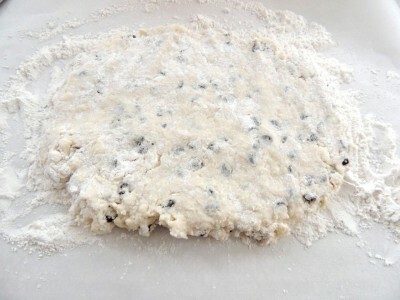 Dump your dough onto the flour lined area. Pat it out into a rectangular-esque type shape with your hands. I pat the palms of my hands into the flour before patting to keep it from sticking too badly but you really should have a little taste of this dough anyway, it is delicious! Okay, now I want you to take one side of that dough and fold it over to the center…. Now fold the other side up over the first side. You end up with a log-ish looking thing but it really is folded together :). 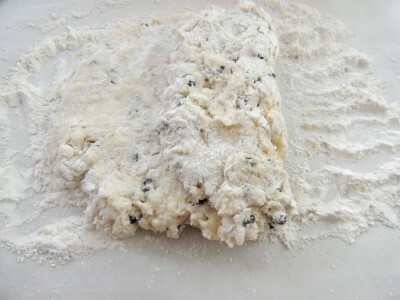 This is a way of kneading your dough without overworking it, which can cause biscuits to be tough. By using this method for the chocolate biscuits, they’re really tender and fluffy. Pat that out again and repeat the folding process one more time. 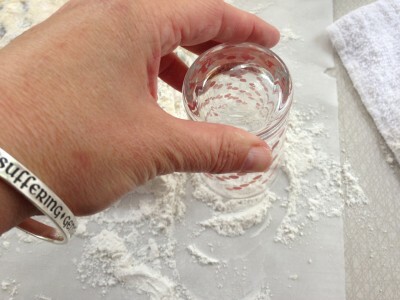 Now take a biscuit cutter or juice glass and tap the rim of it around a bit in some flour. then cut out your biscuits. 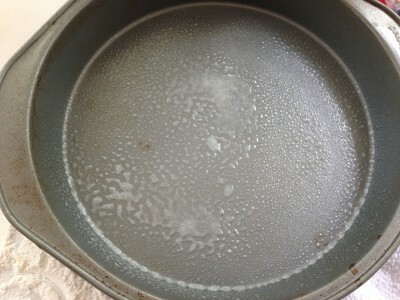 Place them in a pan that has been sprayed with cooking spray. I’m using a round cake pan. This recipe makes about a dozen and you may or may not be able to get them all in this round pan so feel free to use something else. I like to cook them in a pan like this because it helps their sides to touch, which helps them to rise more and be fluffier. 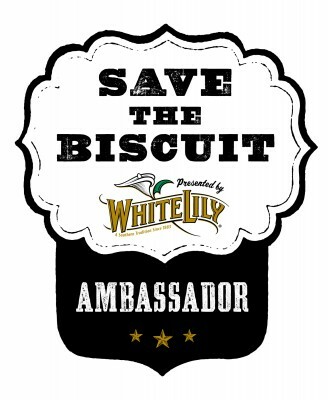 Biscuits are friendly little morsels of bread and they like to be together so that they can support one another and help them to rise up from humble beginnings! Kinda like good, old fashioned friends. 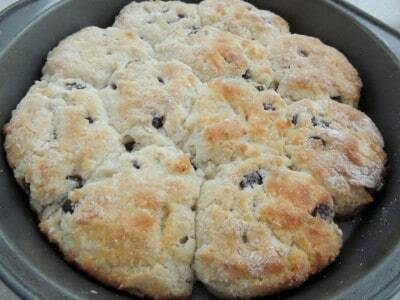 If I have leftover biscuits that won’t fit, I just cook them off to the side in another small pan. Bake these at 450 for 14-16 minutes, or until they are lightly golden on top. Mix up a little sweet glaze by stirring together 1 cup Confectioner’s Sugar, 1 teaspoon vanilla, and 1 tablespoon milk. Stir until all the lumps are gone. Brush this across your biscuits. Allow to sit for just a few minutes until it sets. 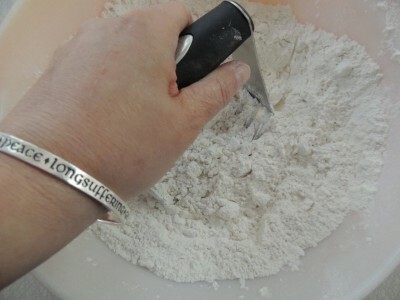 In large bowl, place flour and sliced cold butter. 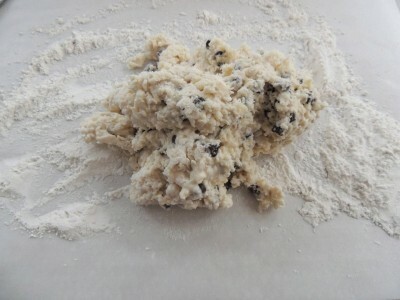 Cut butter into flour with a fork or pastry cutter until fully incorporated and it resembles lumpy flour. Place this bowl in the refrigerator for ten minutes. 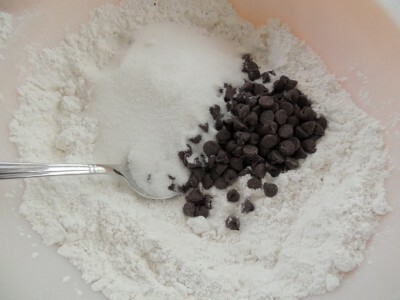 After ten minutes have passed, stir sugar and chocolate chips into flour mixture until well blended. Add milk and stir just until moistened (can add 1/4 cup more milk if need be). 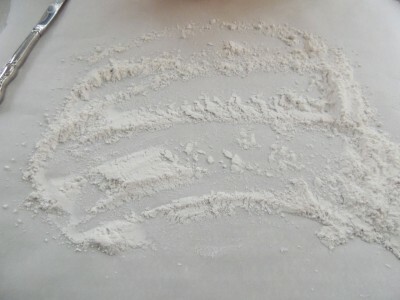 Turn dough out onto lightly floured surface. 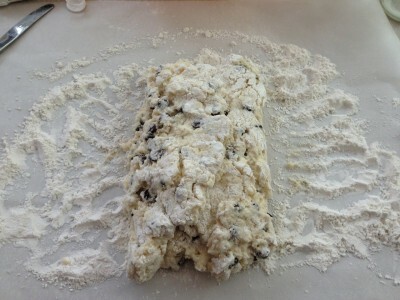 Dip palms of hands in flour and pat out into a rectangular shape. Gently fold the right side over onto the middle of the rectangle. Fold left side over on top of folded right side - like you are folding a piece of paper to put into an envelope. Pat this out again into a rectangle and repeat folding process once more. 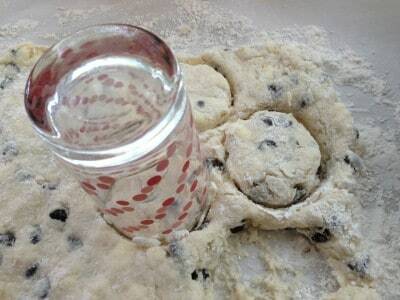 Dip juice glass or biscuit cutter into flour and cut out biscuits. 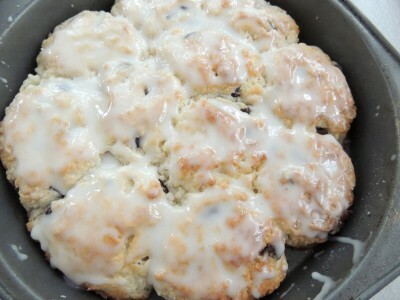 Place biscuits on lightly greased pans with their sides touching. Bake at 450 for 14-16 minutes, or until lightly golden on top. Stir together confectioner's sugar, vanilla, and milk until smooth. 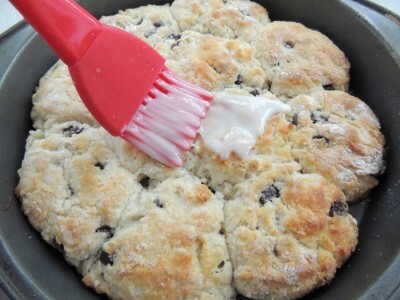 Brush over top of biscuits. Allow to sit for a few minutes before serving. “Blowing out someone else’s candle doesn’t make yours burn any brighter”. ~Submitted by Connie Ayers-Bryant. Click here to add your favorite motivational, encouraging, or funny quotes to our collection! 3 Bean Salad – One of my personal favorites! Oh Christy! They would be so good with this coffee I have right now! YUM!! They go perfectly with coffee Angela!!! Trying these tomorrow a.m. for a last-day-of-school treat. I can’t wait! I hope you all enjoy them and HAPPY last day of school!!! These look delicious! They look similar to Bo Jangle’s bo berry biscuits. Could I substitute blueberries instead of the chocolate chips? Thanks for all your delicious recipes Christy! We just ate your Mama’s Taco Casserole for dinner last night! You sure can! I’d toss the berries in a little bit of flour first so they don’t sink to the bottom. That is a wonderful idea! Hmmm… or cinnamon chips. But these look wonderful as is, too! I feel a baking urge coming on. 🙂 Thanks, Christy. Oh, I LOVE the idea of cinnamon chips in this!! These look great and not too difficult. Love the idea of adding different things such as berries in place of the chocolate chips. Yes, changing them up to suit your taste is a wonderful idea Lisa!! I hope everyone enjoys them Valerie!! My two boys would love these. Anything with chocolate is their favorite. Thank for another wonderfully simple, but tasty recipe. You are the best, Christy! Oh my! These look wonderful – can’t wait to try them with my granddaughter. She’s only 2 but has shown such an interest in “cookin’ ” – her favorite questions are “what’s that?” and “can I taste?”. Thanks for all the good, down-to-earth, family-friendly recipes! Keep ’em coming! How sweet!!! I would love to see a picture!! First of all I noticed your bracelet with the “longsuffering” showing before I even read your note. Second I thought I was the only person that called it globby dough, and third, I look forward not only to your wonderful recipes but your inspiration each day. You are brightening people’s lives, and you help many people get over their fear of cooking certain things ( like biscuits) . Thank you. Oh my goodness, thank you Kathy!! As if you don’t have enough to do already…you and Katy Rose could start a Kid’s Cooking blog…with videos and all. My neice and nephew loved the Kid’s Cooking competition they had on Food Network. You may have a future TV star in the making! Just kidding…not really. LOL, whew!! I can barely keep up here! These look wonderful! But just to confirm – you really bake at 450? Not 350? Yup. Biscuits generally cook at aich higher temperature. That’s how we get golden on the outside and fluffy in the middle. A lot of biscuit recipes cook at 500. Thank you Keith!! That is so sweet of you! Boy these look goooooood! I’d love them with raisins, I’ll have to try that too. I noticed one side of your biscuits were more browned then the other, if I may suggest, turn the pan 1/2 way through cooking for more even browning. Another Christy Great! These sound divine. I would have in the past made these as a sweet treat for sweet teachers but my daughter has graduated and will head to ORU in the fall 6 hours away so I guess I will have to get up early and pass these out to elderly neighbors to go with their morning coffee. Christy I love you site, all of the inspirational messages and great recipes. It is like getting to read a letter from an old neighbor that has a lot of good things to tell us. Thank you Christy. You are too sweet Marsha!! Oh my goodness how time flies. Is she excited to be headed off to college? I know you are sure going to miss her though. These look amazing! Would these be good frozen then reheated and how would I go about that? Freeze before or after baking. We are going on vacay in a month and I would love to make and freeze these now to take with us. Thoughts? I haven’t ever frozen them but it should work, they just never last that long in my house. Let me know if you try it! I have made these several times. They are delicious! I would like to try making them ahead and freezing them. Would it be better to freeze them before baking or after baking? Any tips on freezing these would be appreciated. 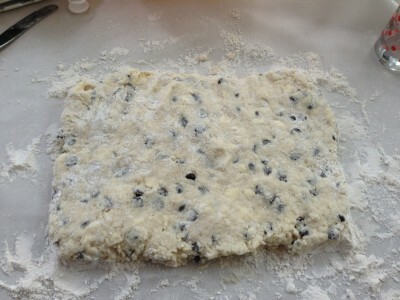 Christy, although I haven’t tried this recipe yet, I do the fold over kneading also (learning on your site). but with each fold over I spread a lite layer of room temp butter then sprinkle cinnamon sugar before folding. It gives it that layer effect of canned biscuits. Also replace the CC with raisins. I make square biscuits so that I don’t have the scraps to rework. Then refrigerate the dough for 20 minutes before preheating the oven to make sure the butter has become cold again. I bet they are wonderful MaryAnn!! These look so good!! I will making these for sure. Thanks so much for all of the good food. I hope you enjoy them Jacqueline!! My dough turned out more batter like..just wondering if it was supposed to be that way? I made it work..just wondering. Your recipes always work perfectly, so maybe I measured something wrong. It should be thicker than batter but it is *much* softer than traditional biscuit dough. How did they turn out? I hope you get to try them soon Debbie!! My dough also turned out more like cake batter – I couldn’t even knead or roll out or anything. Is there a typo in the recipe? My kids are looking forward to trying this recipe again! Uncle Arthur! My grandmother would say “‘ol Uncle Arthur is paying me a visit” when her arthritis was acting up. So would my dad and now me. Never heard anyone else use that phrase! I hope Uncle Arthur doesn’t give you too much trouble. Can’t wait to hear what you think Su!! I cannot wait to make these! I even went out and bought some White Lily flour for the first time ever just to make them! Oh my goodness, you are going to love that flour Jenny!!! I hope you love the biscuits too!! 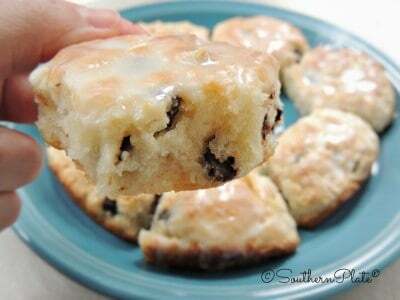 I am going to try these using cinnamon and raisins. I love cinnamon. Ohhh, that sounds good Carolyn!! I hope you enjoy!! I just made these. WOW!! So light almost like a muffin. My dough was very sticky. Im not sure what I did wrong so I didnt know how they were going to turn out but thry were very good. Awesome recipe! I am so glad to hear that everyone liked them Debbie!! I am so glad you liked them Joanna! !